Several quick-service concepts have cobranded with other companies in hopes of leveraging the other brand’s assets, like marketing and menu. But Fatburger is doing something a little different in cobranded locations with its full-service sister brand Buffalo’s Café: It’s adapting much of the latter’s concept, including, in one case, its table-service format. The 150-unit Fatburger opened three cobranded units with Buffalo’s Café, including one with table service, a full bar, and a patio, and two with a quick-service Buffalo’s Express format. Andy Wiederhorn, CEO of Beverly Hills, California–based Fog Cutter Capital Group, which owns Fatburger and Buffalo’s Café, says the two brands are a natural fit, especially because they are under the same parent company. “We have one back-of-the-house kitchen and one cash register system, with two different menuboards and two signs,” Wiederhorn says. While the full-service unit with Buffalo’s Café offers a casual-dining menu including burgers, steaks, and seafood, the Fatburger with Buffalo’s Express has a limited menu of chicken wings, chicken tenders, and 13 different sauces to go along with the burger brand’s offerings. Like with those two Yum! Brands, Wiederhorn says, Buffalo’s Café’s and Fatburger’s menu options go well together. “You can’t add sushi to a hamburger place. It becomes a great way to differentiate yourself from a competitor,” he says, adding that the quick-service burger landscape is so competitive that Fatburger needed something to set itself apart. Keeping everything simple and clear in the cobranded units also boosts credibility, he says. The Buffalo’s Express menu, for example, doesn’t deviate from chicken wings, chicken tenders, and boneless wings. While cobranding skeptics say that merging two concepts can dilute each individual brand’s credibility, Wiederhorn says, adapting two brands like Buffalo’s Café and Fatburger to each other helps draw new customers and can help spike revenue at each brand. Al Ries, co-author of The 22 Immutable Laws of Branding, says cobranding can be an effective strategy to launch a sister brand. Darren Tristano, executive vice president at Chicago-based market research firm Technomic, says pairing Fatburger with a chicken wings concept is a recipe for success. “Since the wings are complementary and not competitive from a meal perspective, this represents a strong opportunity to increase check average and provide consumers craving wings an opportunity to find them while others are looking for a good burger,” he says. Moreover, Tristano says, Buffalo’s Express could capitalize on the success of other wing quick serves, like Wingstop and Wing Zone. “The model to open smaller units, either company-owned or franchised, provides a greater opportunity to keep costs low while focusing on a high demand product,” he says. He adds that some consumers might want to design a meal using the menus of both chains. “They’ll add wings to a burger order,” Tristano says. Ries says the menu at both cobranding participants must overlap and not clash to make the arrangement successful. When McDonald’s owned Chipotle, he says, a potential cobranding deal would have flopped since McDonald’s reputation for indulgent burgers might hurt Chipotle’s emphasis on locally sourced, healthy dining. Cobranding has additional traps, Ries says. For example, if a consumer rejects the food at one brand, it might tarnish the perception of the other. Tristano adds that cobranded units can be tricky to operate smoothly. “Adding new logistics to the ordering and service models can create slowdowns in process and get in the way of customer satisfaction for those who only want a burger,” he says. 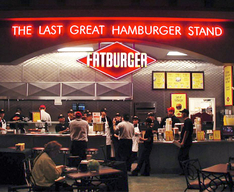 Fatburger has bounced back from declaring bankruptcy in 2009. It’s nearly quadrupled its number of outlets since bankruptcy and has done well overseas, particularly in China, Taiwan, and Singapore. Wiederhorn say more growth is on the horizon. He expects 50 new Fatburger, Buffalo’s Café, and Buffalo’s Express units to open in 2014. About a dozen will be located in Europe, and the rest in the U.S. This entry was posted on Tuesday, December 3rd, 2013 at 4:37 pm and is filed under Co-Branding, Franchise Activity, Future Plans/Announcements, Menu, Quick Service. You can follow any responses to this entry through the RSS 2.0 feed. You can leave a response, or trackback from your own site.